Nearly ten years ago, I did a thing that I found very strange at the time. I joined a business management graduate scheme. If you’d asked me at the time why I did it, my answer would’ve been this: I originally applied to the marketing scheme, because that looked fun. The recruitment people rang to say marketing was full, but business management had spaces if I wanted to transfer my application over there. I was late for a seminar, so I said yes to get them off the phone. I somehow made it through the application process in a haze of Red Bull and Marlboro menthols and shoddy research in between essay deadlines, and they offered me an actual paid job. I was hungover and half-asleep when they phoned, and I panicked and took it. For many, many years after that I wondered if I’d made an absolutely hideous mistake and derailed my life through a series of decisions made mostly in the interest of getting off the phone quickly. It wasn’t the most thought-out of career paths, and I wasn’t really a business-y person. I didn’t wear suits, I thought ‘touching base’ sounded kind of filthy, and I generally didn’t have much of an idea of what I was doing. It was only after I’d managed to shuffle my way sideways from what I thought of as the really businessy business stuff over into communications that I became even vaguely confident in my own abilities. But I never quite shook the idea that business wasn’t really for me. So, when I decided to start The Woolly Badger, I didn’t really think of it as a business. I thought of it as a creative outlet, a way of reclaiming my identity after the onslaught of new motherhood, a thing to do while sitting on the playmat – but not a business. The plan was to knit some hats, put them on Etsy, and see what happened. That was it. To paraphrase Friends, it wasn’t really a plan – it was a “pl” at best. After all, I’d never been one of those people who dreamt of owning their own business. Sure, I had a lot of respect for the people who did have that as a dream – except, generally speaking, for the ones who appeared on The Apprentice – but it did not seem like a thing that would be for me. I’d escaped from business a few years ago, so why would I be wandering back in? It turned out I’d wandered back in without even noticing I’d done it. I was plodding along one day (literally. I do a lot of walking to try and get my son to go to sleep) thinking about what I wanted to knit next, and how I should try and market it, and what tags I should use and whether I should do a promoted post about it on Instagram, when I suddenly realised that I was coming up with a business plan. Which obviously surprised me, because in order to have a business plan, you surely first needed a business. It was then that I realised that yes, I really had started a business without actually noticing it. And I’d done all sorts of business-y things without even realising that business-y was what I was being. Which is how I now, almost ten years after I joined that graduate scheme, have finally come to the conclusion that I’m really bloody glad I did. Because as an accidental business owner, it’s quite reassuring to have some actual experience behind me. I can write a business plan. I can set up a spreadsheet in a way that makes sense. I can have a think about long-term goals and quarterly objectives and try to come up with a plan that’ll get me there. And I’m actually really bloody enjoying it. Admittedly, I’ve not done a tax return yet, so you may need to come back to me around mid-January to see how badly I want to stab myself in the eye with a spoon. But for the moment, I’m actually not horrified by the sight of Excel. Which is something I thought I’d never say. Dreams and plans and babies and tea. All the tea. I’m currently taking part in the “March Meet the Maker” Instagram challenge over on (shockingly enough) Instagram. You get a prompt each day, and you post about it. It’s theoretically that simple, but like most simple-sounding things, it can be surprisingly hard. Not today, though. Today is “dreams and plans”. And oh my, do I have me some dreams and plans. I also, however, have a one year old. And one year olds and plans don’t always mix – unless your plan is to stack some stuff up, knock some stuff over, and then throw some washing around. In which case, if we’re honest, the one year old will probably decide to shuffle off after a cat. Because I have a sleep-immune baby, I really struggle to write with him around. I’m only managing to write this now because he’s at nursery, which he goes to for a grand total of four hours a week. The rest of the time, writing is largely impossible. He’s really into buttons at the moment, so the sight of a laptop is the only thing more exciting than a TV remote. Hit the buttons! Hit them all now! Knitting, meanwhile, he does not care for. Possibly because I’ve been doing it since he was teeny-tiny, or maybe because it doesn’t involve buttons until the end, and even then they’re not particularly exciting buttons. But he doesn’t care. I can sit there, and I can knit, and he’ll bash duplo together while I try to talk to him about what colours the blocks are, and everyone’s largely happy. But then we get to those dreams and plans. And I find myself faced with old problems again. 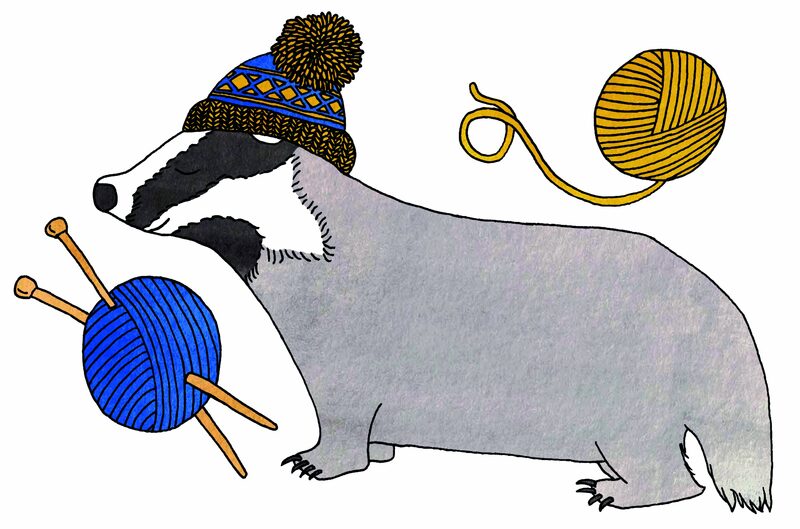 Because I have things I want to do with the Woolly Badger. I want to write and release patterns. I want to design different garments – including, maybe, some for adults. I want to collaborate with indie dyers, and I want to go to yarn shows, and I want to try and convince the local independent shop to stock my stuff, and I want to maybe run some workshops to teach kids to knit because how bloody cute would that be and I want to and I want to and I want to. And in amongst all that I still want to write. How do I do all this when I spend my life on a playmat with a baby who won’t let me out of his sight? I have no idea. So I am, slowly, slowly, working it out. I’m not entirely sure how I’m going to do it, but I’m pretty certain it’s going to involve bucketloads of tea. Until then I suppose I should be grateful that Billy’s looking like being a late walker. There’s only so far you can bumshuffle before you reach a ledge you can’t get over. Fingers crossed that’s not a metaphor.